Chocolate Chip Cookies Stuffed with Nutella – say what?! 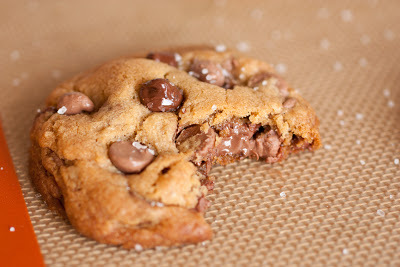 You get a chewy browned butter cookie studded with lots of chocolate chips, and they’re stuffed with rich Nutella and finished with sea salt! I’m telling you, they are one of the best cookies you’ll ever eat! I’m unequivocally in love with these purely divine cookies. Have you ever seen a cookie loaded with so much goodness? 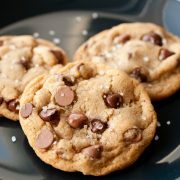 Browned butter, two kinds of chocolate chips, Nutella, vanilla beans and sea salt! You could even add in some finely chopped, toasted hazelnuts for one more upgrade and an added crunch. This cookie = love. You don’t know food love until you’ve tried it =). I want to hoard them all away for myself. I know the prep work is a bit more work and definitely a longer wait than your average chocolate chip cookie but it is so worth it. Warning! 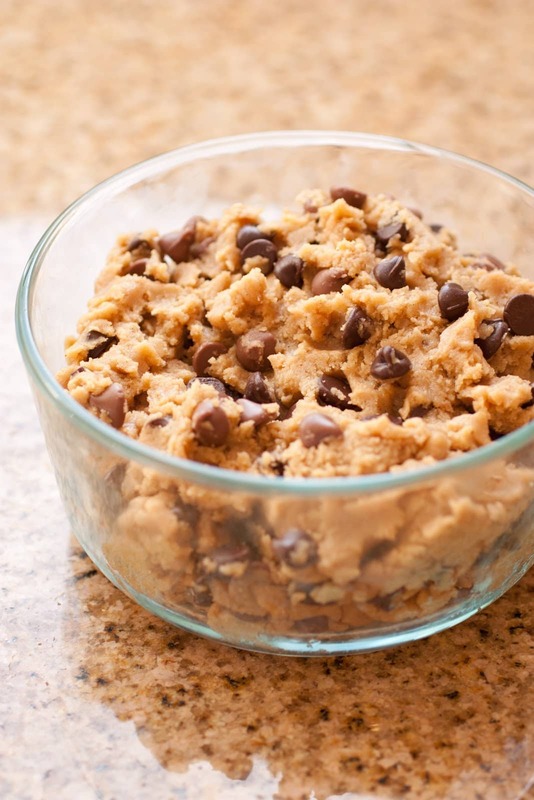 Don’t eat the cookie dough…but it is the BEST cookie dough in the world. 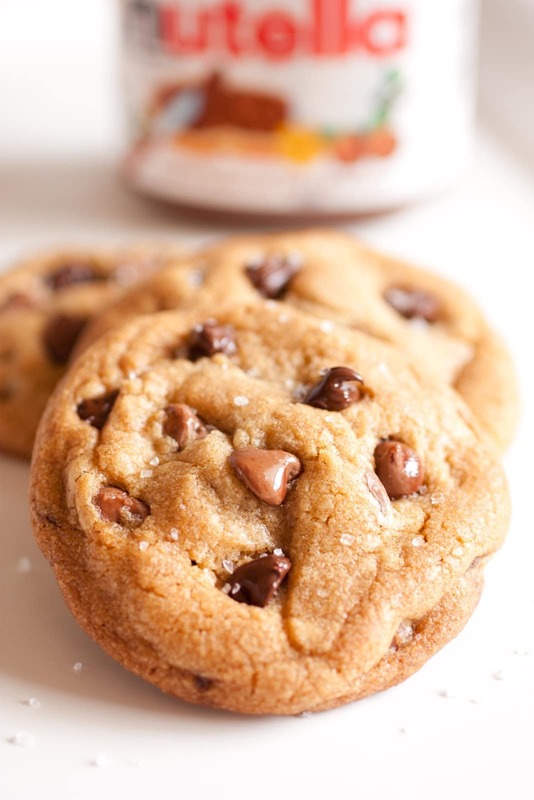 Between the browned butter and use of only brown sugar it has such a caramel-like flavor to it. With that said I’ll explain how to make it safely edible. 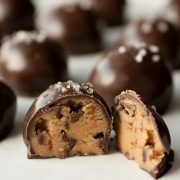 Simply omit and replace the eggs with 3 Tbsp cream or half and half, and if you want some Nutella in there simply swirl in a few tbsp and finish it with coarse sea salt (obviously you wont be able to make cookies out of it this way though, but you’ll have a giant bowl of cookie dough to enjoy). 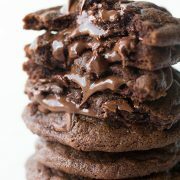 This recipe reminds me of this print I want to buy, it says “Keep Calm and Eat Cookies.” Definitely a great life moto =). Enjoy! seeds of 2 vanilla beans (or increase vanilla to 2 tsp)* I sell them! Brown butter in a medium saucepan (for a step by step guide of browning butter, see the directions of this recipe here). Pour browned butter, using a rubber spatula to scrape out any excess, into the bowl of an electric stand mixer and allow to cool until lukewarm, about 20 - 30 minutes. In a mixing bowl, whisk together flour, baking soda and 1/4 tsp kosher salt, set aside. Add light-brown sugar to cooled butter in stand mixer fit with paddle attachment. With mixer set on medium-low speed, blend mixture together until well combine, about 1 minute. Add in vanilla bean seeds, and vanilla then add in eggs one at a time and mix until well combine after each addition. Set mixer on low speed and slowly add in dry ingredients and mix just until combine. 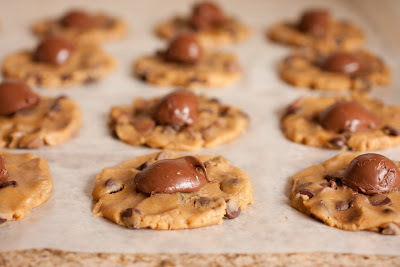 Mix in chocolate chips (if you want some chocolate chips showing through as those pictured, I like to set some of the chocolate chips aside then I gently press about 5 of them into the top of each cookie dough ball after shaping). Transfer dough to an airtight container and chill in refrigerator about 1 1/2 hours. Preheat oven to 350 degrees. 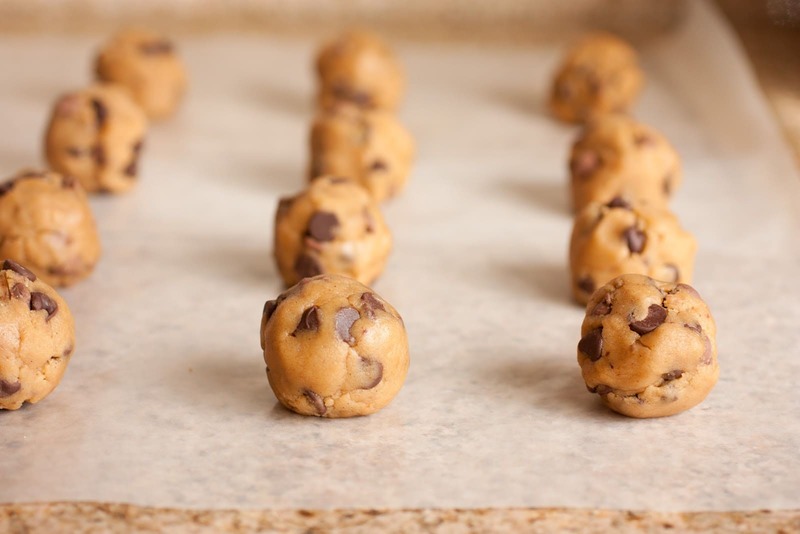 Remove dough from refrigerator and scoop dough out about 2 1/2 Tbsp at a time and shape into balls, then align them on a large sheet of parchment or wax paper. Evenly flatten dough balls until you have about a 3 1/4-inch circle, then place 1 tsp chilled Nutella in the center on top of each. Carefully fold dough up and around Nutella, covering it entirely (if you find it beginning to seep through in some areas, I just added a chocolate chip to that spot to act as a plug). Transfer to a Silpat lined cookie sheet (you can fit 8 cookies per sheet) and bake in preheated oven 10 - 12 minutes until golden brown. Remove from oven and immediately sprinkle cookies with coarse sea salt (you can also sprinkle them with sea salt before baking as the salt sticks better that way, I actually did a tiny before and after). Allow to cool several minutes on cookie sheet before transferring to a wire rack to cool. Store in an airtight container. *For cheap vanilla beans, this is where I purchase mine for .50 cents a piece. Best deal I've found yet.